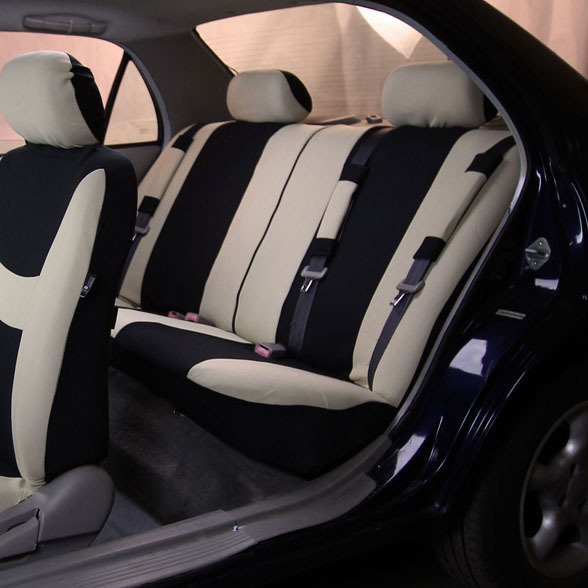 Would heated seats damage the material? My Jeep has heated sests. Thank you. Thank you for your inquiry. This item is compatible with heated seats. Feel free to use them without worry. Enjoy! Just wish it would have come with two more covers for the middle seats in the van. easy to install, looks great. All around win! Product is exactly what I hoped it would be. Product is great. Back seat covers are more difficult to install. Fits well but it took me awhile to put on. Way better than I expected, specially for the price I paid. My daughter loves them and they look great in her car!!! I truly enjoy these seat covers! I am a budget shopper, who still likes a little bit of style. These covers do the job perfectly! I just bought by second set, in Maroon accent this time. My first set lasted me almost a year! Perfect for adding a little bit of color and style to an older car! Keep making great products FH Group! Excellent fit! Just what I was looking for! Great product but unfortunately they did not work on the vehicle I??? purchased them for. We had to do our own thing with the back seat of our PRIUS, but it works ok for us. Wife loves it,make her car look real luxury. I got the seat covers for my daughter for college graduation. She loves her car again. These covers fit as if they were made specifically for her car. They look great! Having a link to video instructions made it easy to assemble! Loving the new look in my car! Does not fit a 1990 Jeep Wrangler which is what I have. 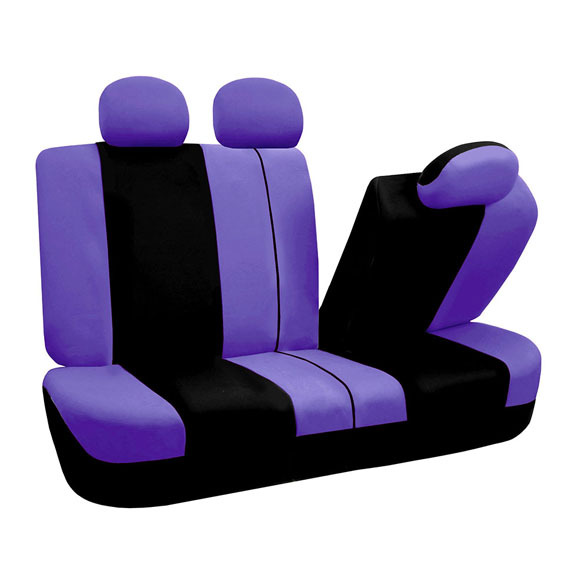 I purchased these seat covers in purple for my new Jeep Wrangler and I absolutely love them. The color was spot on and they were super easy to install. I have recommended to everyone who asks where I got them and shared this website with all my Jeep friends. This is the second set I’ve bought, they made some improvements to the color placement which I believe will help with the life span of the seat covers. Love the colors. Nice for the price. Rips easy. Still cute. Easy to install and light coverage. I have not put seat covers on yet. It is excellent I love it thank you. I love the way they feel. Kinda hard to put on unless you have some help. 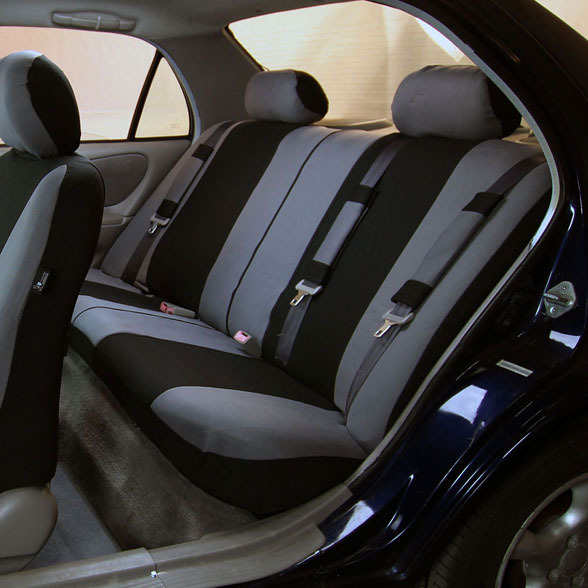 I didn’t realize that you had to take your whole back seat apart to install the rear seat covers. but there was a video that you could watch to see how to do it. Still attempting to put on, as back seats fold and is not a bench. As expected. Really brightened my car!! Great fabric. Easy to install. They were slightly too small for my Kia Soul seats but still look great! I received my breezy seat cover and instantly thought that this was going to be a difficult task to do. But with the help of the video I was able to place them with no problem.. it was a great buy. Thought these Zipper was allowed to split back bench cover to accommodate two bucket seats but it will not even still overall nice product. They fit my seats perfectly, it’s just what I needed. Look great and I am just waiting for a half way nice day weather wise to go out and put them on. Doesn’t fit as well as the pictures on my Toyota corolla seats, but they look nice and they are functional! Great deal for the price. 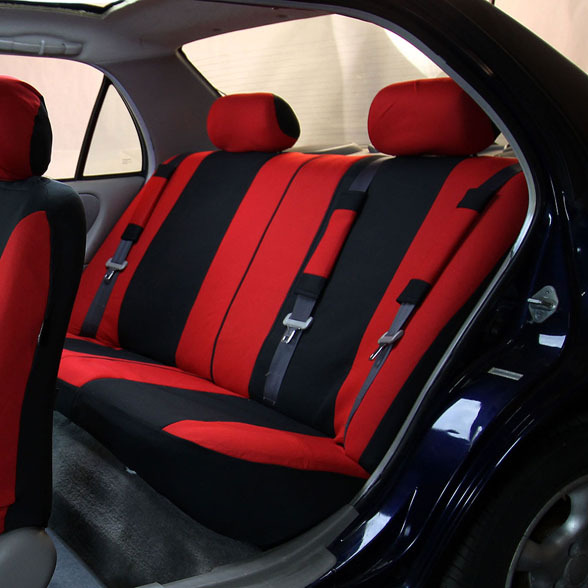 My car looks even better and my passengers all like the seat covers. Nice quality. Easy to install most pieces. Price is very good. The rear seat covers are a pain in the rear to install but once we got them in they look great! I have a 2016 Hyundai Tucson and they fit really good. Very nice, I even like the whole new car smell that the product has 🙂 All of it was fairly easy to put on except the head rest, a few of the head rest covers tore at the bottom seam as I tried to get it over the head rest. Elastic at the bottom of the opening would be ideal. So far I just installed the front seats. It went smoothly and look great. Talk about a transformation! I bought these to preserve the leather on my Jeep. These are brilliant colors which is fun. I tackled the front seats first, as they seemed easiest. I will put the back seat covers on when I have time to actually devote to doing it right. But so far, love ’em! Takes awhile to put on the seats. One of the front seat covers tore when putting on. Nice for the price. My husbands really likes the new seat covers! They look great! Great Deal. Easy to install. Like that the back seat came with additional pieces so you can customize it to fit a bench that splits where it folds down. A zipper did break but I think I can fix it. The black & mint is so sharp! Makes my interior look brand new! enjoying the new change for my truck. 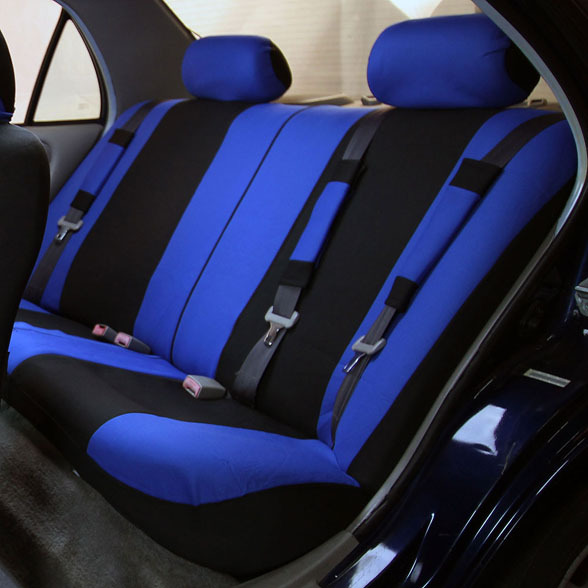 Love the seat covers and color. Easy to install. Did so without using the instructions! I need to change color how do I return? Everything fit perfectly except the steering wheel cover, which wasn’t a big deal. My husband likes the material of these covers. Nicer than any other we’ve purchased. A great product. Would definitely buy again. 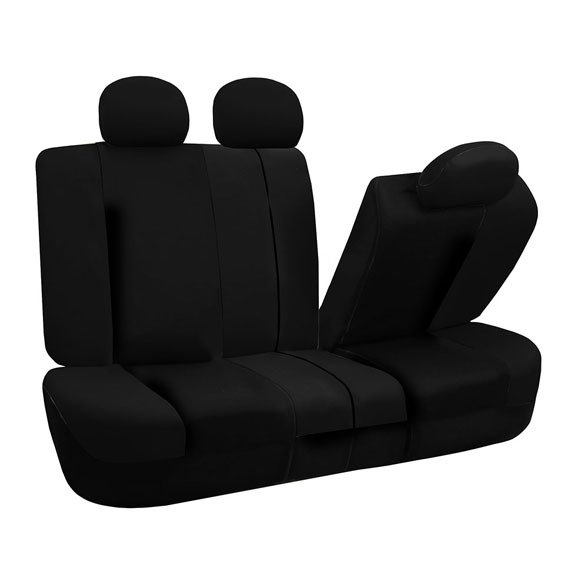 Liked the product, took me a while to figure out how to put the backseat cover on; as it didn’t come with instructions. Love the fit, the many secure features which allow great fit with no annoying sliding, and LOVE the color! The car seat covers are a perfect fit. Great item and easy to install. Easy to install and sharp looking. So awesome !! I totally love it. Love it and perfect fit for my car! At first sight these might seem a little thing, but don’t let that fool you. My car has leather seats cracking and I needed something to help my car look better. These are gorgeous and told pretty tight to the seat shape. The back seats were a little awkward to install but once we figured it out they are just as wonderful!! I love the color but they were a little challenging for me to install in my Honda Civic. I absolutely love this set! The black in the middle works perfectly, because it’s not easy to get dirty. Love it! My items was delivered faster than expected. The color was a little off, but the fit was perfect. Having a video along with the paper manual on how to install the seat covers was GREAT. Loved the color and the ease of putting it on! 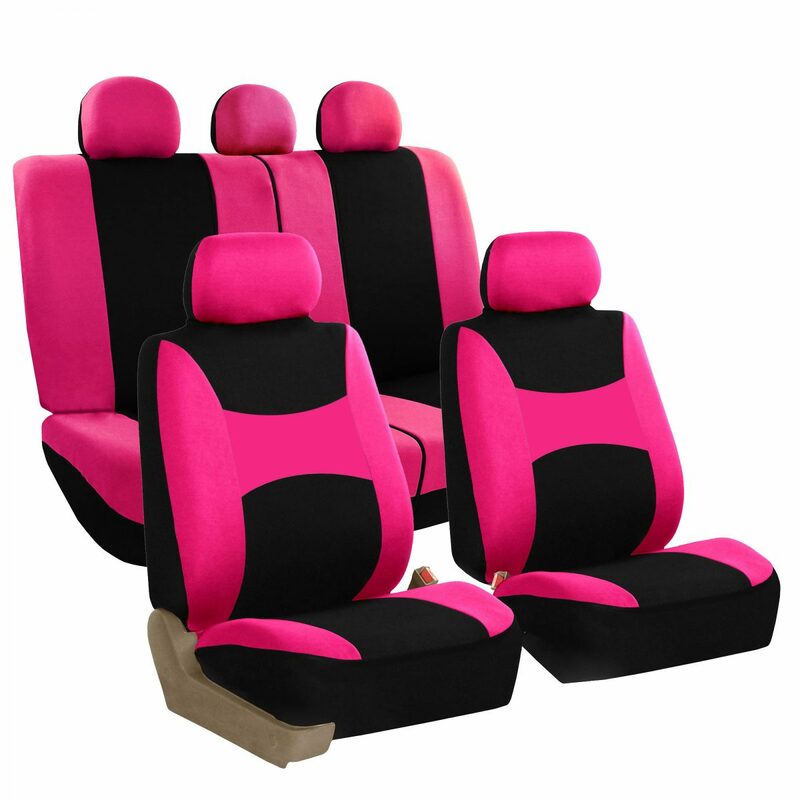 I love pink and want to add some color to the inside of of my new car. Love it! Really nice quality and the fit was great! Very pleased! The seat cover at nice and large enough to fit my truck seats with no problems. Not hard to put on . They look great once they’re in. Luckily there are videos to help with installation. perfect for our car. looks great. They look and fit great, if you take time to familiarize yourself with their installation instructions all will go well. No sweating- important living in Texas! Only minor complaint isI do have to keep a lint roller in the car, if you transfer anything from your clothes to seat covers it will stick. The seat covers are very soft and easy to install. I couldn’t use the back covers because of how my back seats installed but the front seats are great. My car now looks like a sports car. They are very nice, and Comfortable. Super cute, kind of thin material… but think it will keep the sons crumbs and fun off my new car seats! 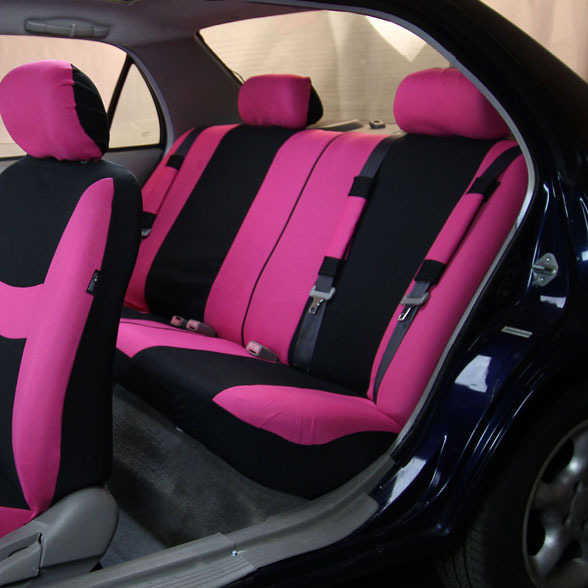 I’m giving 5 stars because these seat covers are inexpensive, easy to put on and they look good too!! Great purchase. I was able to fit the seat covers to my car perfectly and they look great. The product is good, a more thicker material would have been more helpful and would look more elegant. They look great, but thinner than expected. It was what I expected! The smell alone set my son’s asthma off. We had to take them out of the car. Appearance is great and fabric is beautiful. For my front seats seems a bit short but it works. Thanks for a good quality cover at a decent price. Super happy with our purchase! Easy to install, and made the inside of our weathered, old truck look so much better! The only bummer was the arm rest covers were too narrow for our model, but everything else fit great! And honestly, the arm rests were the least of our worries. Great product for a fair price. Probably going to order a 2nd set for our son’s car. There a gift and haven’t been put on. Haven’t installed them yet just got them in today abso-freakin’-lutely love the lime green color and the video on installation seems spot-on! These make the inside of my old car look so much better. They are great! I like the covers, seat belt, and steering wheel cover….didnt put the back seat covers yet, big job for me…they match great! They look really nice and won’t slide off like the kind from Wal-Mart. A bit tricky to get on, however. I bought 2 of these sets. I have only put on my front sets so far and the steering wheel cover, but I love them. Super easy to put on and I love the bright Green color. Fit well and look good. Was,a little apprehensive about cutting covers for the seat belts to pass through, but they seem fine. Awesome. I had just got my dad a new red car and it was brand new but just a base model. These covers make it look like an expensive sports car. He is so proud of it like a little boy with a new toy. Highly recommend this set. I love it! They look beautiful!!!! I paid 29.00, I wasn’t expecting too much. I think they are good quality, I got green and it is, as described. I haven’t had a chance to install all four seats but in my 2004 Honda Civic sedan the drivers seat fits perfectly.